A young prince and a beautiful young princess entered Ubud Palace breezeway on two open wooden palanquins carried by Ubud residents. Following them were the royal family members carrying offerings and the deceased’s belongings. Then, the body was taken out in a white wooden coffin along a tall bamboo platform that stood above the palace’s outer wall and into the nine-tiered cremation tower. It was around 12 p.m. The pelebon agung — the royal cremation — for Tjokorda Istri Sri Tjandrawati, wife of Ubud Palace heir Tjokorda Gde Putra Sukawati, was about to start. Thousands of people flocked to Ubud Palace on Friday morning to witness the cremation procession, including locals, tourists and journalists. At 11 a.m., the palace started the procession by welcoming guests and expressed its gratitude for the successful preparations. Family members also asked guests to forgive the deceased. The grand cremation procession started at around 12:30 p.m. The body of Cok Sri — as the deceased is referred to — was transported from the palace’s pavilion, where she was placed on the 25-meter-high cremation tower. Around 5,000 men were assigned to lift the tower and the purple bull wooden sarcophagus to the royal cemetery, located around 1kilometer to the east of the palace. Three hundred men took turns relaying the tower while 200 people at a time lifted the 7.5-meter-high buffalo-shaped sarcophagus every 50 meters, until they reached the Dalem Puri royal cemetery. Roads were closed to vehicles during the procession and electricity was shut down as cables were removed to prevent any disturbances during the journey to the cremation tower. Upon arrival at the cemetery at around 1 p.m., Cok Sri’s body was then placed in the sarcophagus. Ceremonies were conducted after the body’s arrival and preparation for the cremation went on afterwards. At exactly 3:15 p.m., royal family members symbolically started burning the sarcophagus. 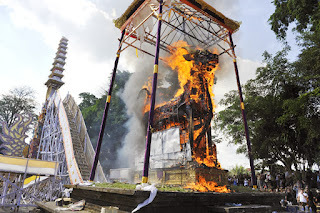 The cremation was semi-modern as two fire sprays were used to accelerate the cremation procession to make sure that the body had totally turned into ash; different compared to the traditional way, which fully relies on wood. The burning stopped at 4:30 p.m. Royal family members then started cleaning the remains with coconut water and rearranged them to shape a human form and placed it on a piece of cloth. The family then scattered the remains off Matahari Beach in Sanur. Meanwhile, residents disassembled the cremation tower and burned it to ashes as well. Royal family representative Tjok Gde Raka Sukawati expressed his gratitude to residents of Ubud, whose hard work made the procession possible. “The procession went smoothly, thanks to everyone,” he told Bali Daily after the ceremony. Ni Wayan Rai Rupini, one of the deceased’s best friends, expressed her sorrow over the death of her friend since kindergarten.